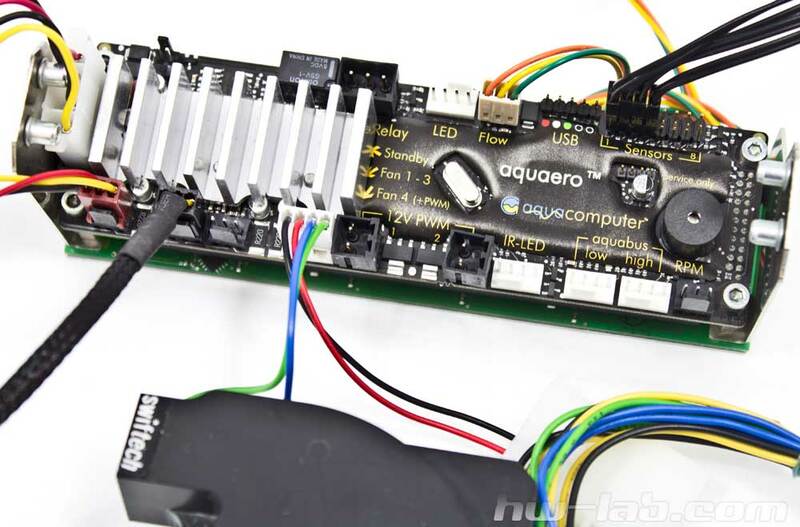 Aquaero 5 XT was tested on an open benchtable, thus there was minimum problem installing it into 5.25″ bay. However, touch buttons on front panel are quite sensitive which makes setting the device’s functionality rather difficult. Manufacturer explains it to be controller’s grounding issue. To solve it, one can electrically isolate device by adding paper above and below Aquaero 5 XT or make mounting plates out of non-conductive material (plastic, cardboard, etc.). Another way to deal with Aquaero 5 XT sensitive display is provide sufficient grounding for your entire chassis (can require PSU changing ). There is an even more complex solution to this problem. Touch buttons make contact through a thin layer of self-adhesive foil. Disassemble the front panel and carefully lift off the acrylic front which hides the foil. Remove it and assemble the device back. After this you will most likely need to increase key sensitiveness in controllers settings. Considering some grounding issues with Aquaero 5 XT touch display the remote control unit included with this model is a good alternative for setting up the device. To power up Aquaero 5 all you need is to connect a 4-pin Molex connector. Note that larger size heatsink make it no so easy, requires to slightly pull the side mount panel. Those of you who has PSU with EasyGrip molex connectors should think of getting simple Molex A Molex B extender or just change it to a standard one. Installed waterblock reduces all the power connector fuzz a bit. 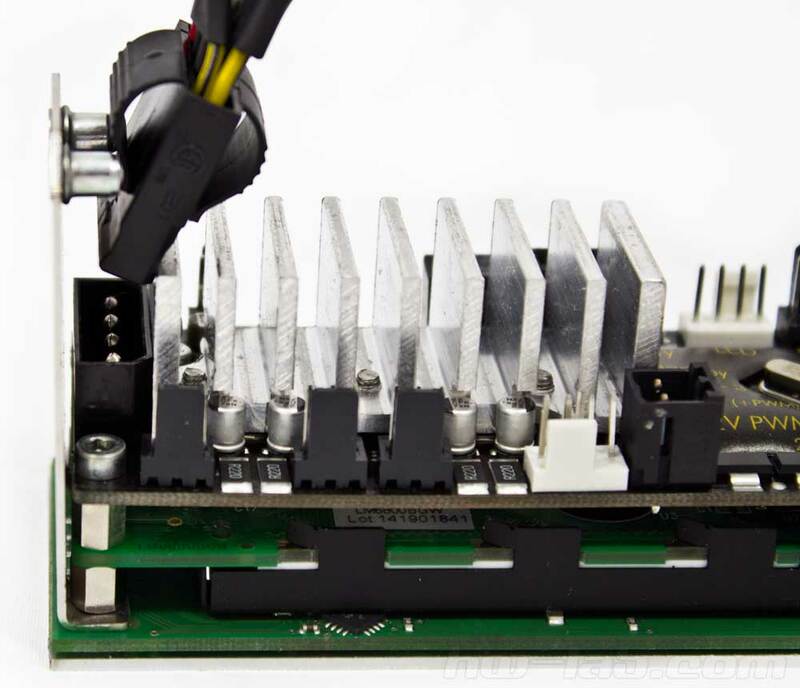 On the other hand, pulling out the power connector is evenly difficult either with heatsink or with waterblock — mounting plate’s outdents stand in its way. In this case, just unscrew two bolts on front panel, pull of the side mounting panel, take out the power connector and reassemble the the device. Since temperature sensors are the common ones to control the rest of devices from, we have installed them in first place. Same as Aquaero 4, the novelty does not include fan extension cables, so buyers should think of it in advance. Lucky we have couple of these in our lab. 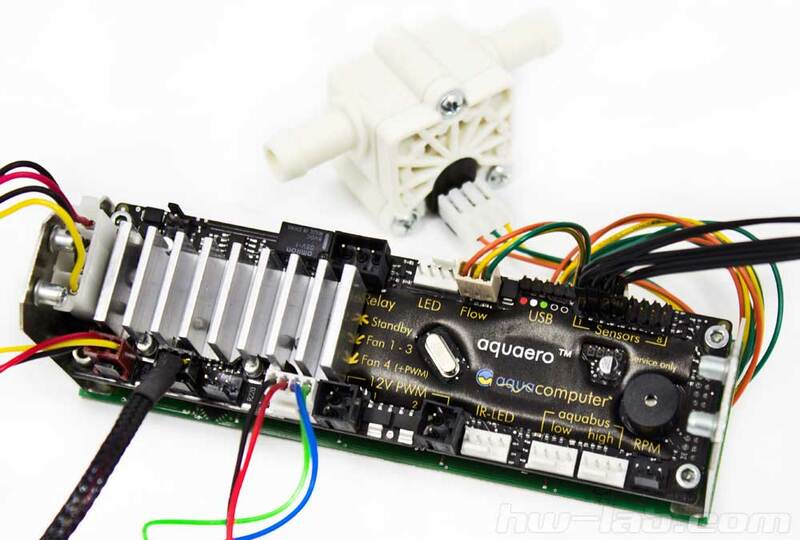 Therefore we had three fans mounted on a LC radiator and one fan for cooling Aquaero 5 power transistors(if requires) all connected to the device. 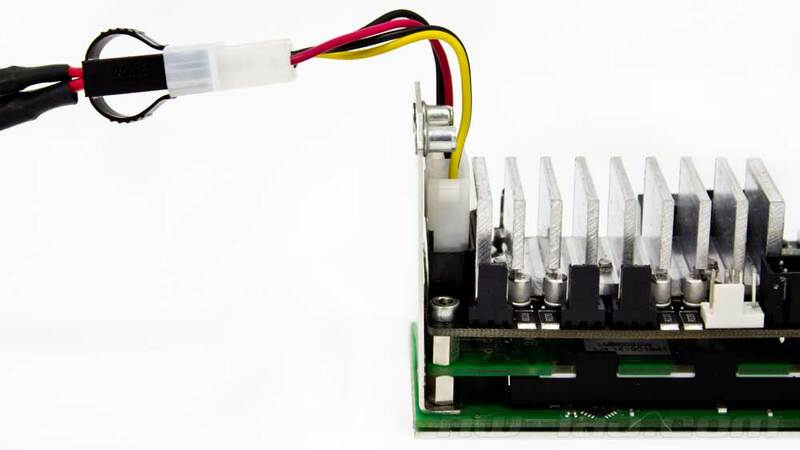 In this test we used Swiftech MCP35X pump connected to the fourth Fan control channel in order to use all the benefits of PWM speed management. 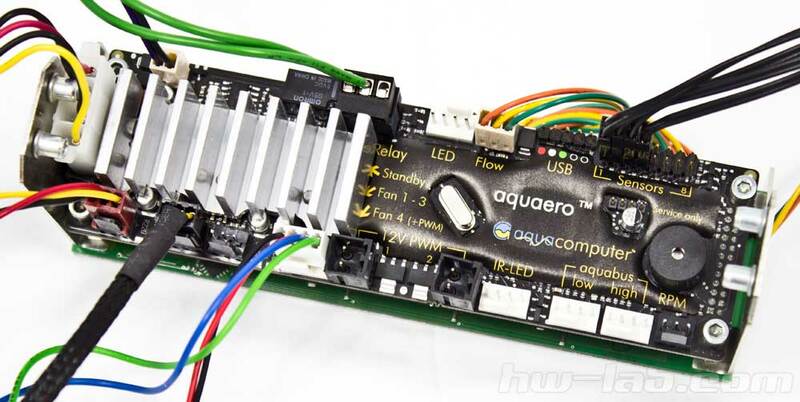 As specs go, you can power and control any DDC type pump directly from Aquaero 5. Experiment wise, we connected all four wires of MCP35X pump to the controller, although the pump can be separately powered via PSU Molex connector. Notice: due to to close allocation of power transistors it is recommended to connect great power consumers (current consumption 1A or higher) to the outside connectors i.e. 1st and 4th, to avoid excessive transistor overheating. To measure the speed of heat carrier inside LC loop we have used Digmesa FHKUC 70 flow sensor which requires special cable for connection to Aquaero 5 FLOW connector. At this stage everything is ready for the first start. USB cable is not necessary to connect as nearly all the settings can be adjusted thought front panel, which makes it different from Aquaero 4 where the list of setting that could be changed via front panel wast quite short. Such rich front panel functionality of the novelty is also explained by this: Aquasuite 2012 software had not been not fully functional by the time the device was ready for market, so manufacturers did not wanted to make any more frustration for potential buyers and came up with such a decision. This is one of key ideas laid down in “Importance notice” that comes with the package. By the time this article is published, Aquasuite 2012 has still Beta-status and available for download from company’s home-page. In order to use you need to connect the device and your PC via USB cable. Pay attention that to fully adjust Aquaero 5 settings you only need power from a USB-port in Standby mode. 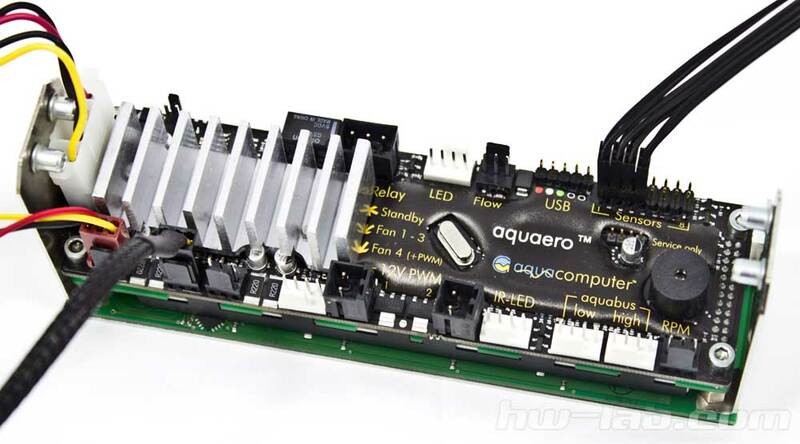 Therefore, it is strongly recommended to shut your PC completely before connecting Aquaero 5 via USB interface. There were no difficulties of connecting the cable to Aquaero 5 — the sticker has cable color scheme that helps in non-mixing up the polarity. 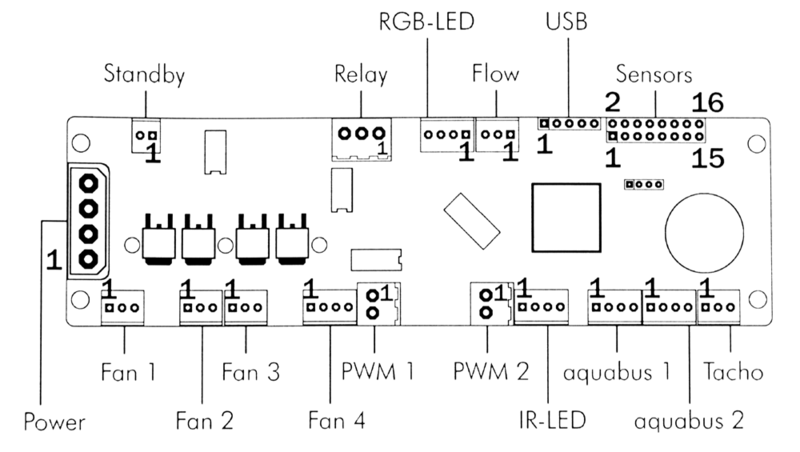 On the other hand, same as for Aquaero 4, manufacturer did not came up with some kind of special plug for the other end of USB cable, thus users are recommended to check USB pin layout on their motherboard (read the manual) before connecting.